Years ago, I drove from north Georgia to Jackson, Mississippi to take a collage workshop from Gerald Brommer and it was well worth the trip. Jerry is an excellent and inspiring teacher and I have continued using his technique that he taught us to produce collages ever since. I have come to call the resulting work “painted collage” to be more descriptive. “Mixed media” has always bothered me as being much too general (it really does not tell you what materials have been used) and there are so many kinds of collage. In this technique, paint is applied to washi, Oriental hand-made papers, either before or after gluing them in place (or both). Watercolor paints work very well and thinned acrylic paints do also. Sections of the washi, which comes in fairly large sheets, can be torn to leave more organic edges. It can be almost painful to tear the sheets since the papers are so beautifully made, but the results are worth it. Applying paint to the washi helps bring out the various textures within each type of paper. Layering the papers during the collage process can build a very rich surface, with colors and texture combining through the translucence of the paper. 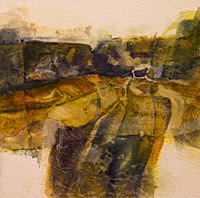 Jerry Brommer continues to teach workshops on collage and on watercolor painting. I highly recommend his workshops as a means to explore design, color and texture in a way that tends to "loosen up" results for the artist. Jerry also has written many books, at least two of which are about collage. The technique mentioned above is described in a chapter of his book, Collage Techniques: A Guide for Artists and Illustrators.